Reading School District invites the community to join our art teachers and other staff members for our annual Back-To-School Sidewalk Chalk Event from 5-6 p.m. on Sunday, August 27. The event will be held at all 19 school buildings, where we will team up and write encouraging sidewalk chalk messages for students as they return to school on Monday, August 28. 1. On Sunday, August 27 between 5-6p.m., head to your neighborhood RSD school – or any RSD school you want! All 19 school buildings are participating this school year. Bring your family, friends and neighbors! To see a list of schools, visit ReadingSD.org. 2. No drawing skills necessary. Just bring your creativity and positive vibes! Chalk (and ideas) will be provided, but you are also welcome to bring your own chalk, too. 3. 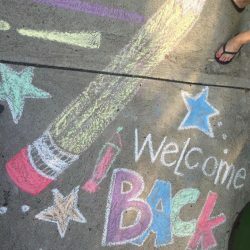 Draw encouraging messages and pictures for students to see as they return to school the following morning. Stay for an hour or just a few minutes — totally up to you! 4. If you are tech savvy, share pictures of your sidewalk chalk artwork and messages on social media. Be sure to tag Reading School District or use our district hashtag #RSDproud. Special thanks to the Reading School District art teachers for helping to coordinate this project and to our Chalk Sponsor, RHS alum Tim Profit, manager of Savage 61 Chrysler Dodge Jeep Ram. Rain Date: Monday, August 28.